Cherry House Café understands that every party or event is a unique occasion, from weddings, graduations and birthdays to everything in between. That is why we offer enticing, buffet-style catering to complement your event at excellent prices - an unbeatable combination. Catering packages are designed for a minimum of 25 guests. Ranging from gourmet salads to meat and cheese trays, classic soups and more, Cherry House Café has the home-cooked selections that help to make your occasion memorable. 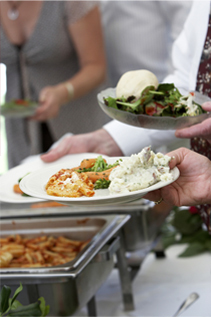 Contact us at 937.320.6200 to help you plan the perfect event with a menu that will suit your taste…and your budget! Preferred Caterer of the Mangan Banquet Center. Ask about our 5% discount!